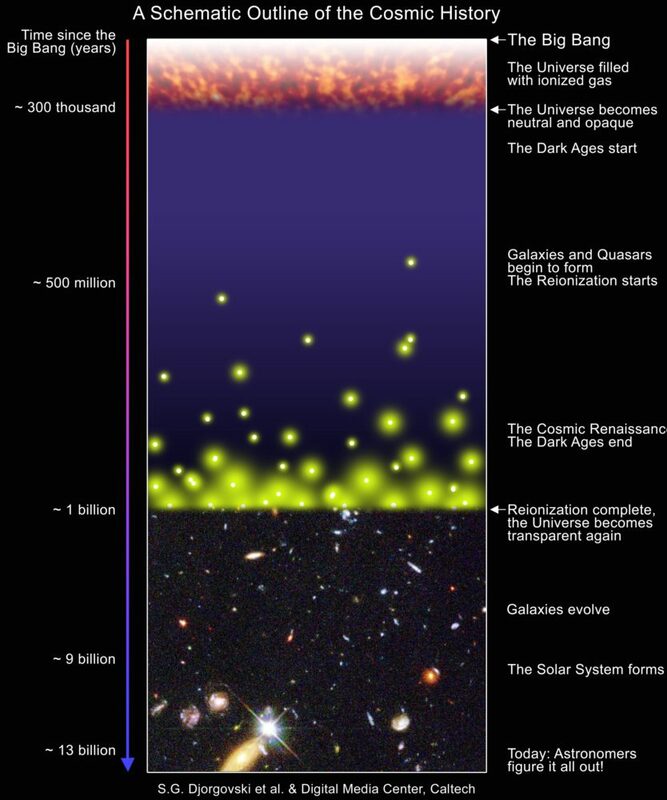 The results, reported in the Monthly Notices of the Royal Astronomical Society, have enabled astronomers to zero in on the time when reionization ended and the universe emerged from a cold and dark state to become what it is today: full of hot and ionised hydrogen gas permeating the space between luminous galaxies. The new study concludes that these variations result from large regions full of cold hydrogen gas present in the universe when it was just one billion years old, a result which enables researchers to pinpoint when reionization ended. 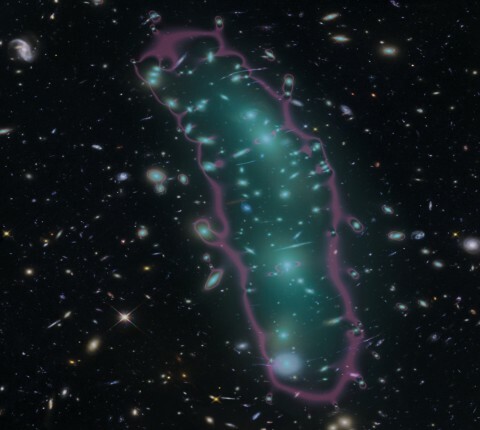 During reionization, when the universe transitioned out of the cosmic ‘dark ages’, the space between galaxies was filled with a plasma of ionised hydrogen with a temperature of about 10,000˚C. This is puzzling because fifty million years after the big bang, the universe was cold and dark. It contained gas with temperature only a few degrees above absolute zero, and no luminous stars and galaxies. How is it then that today, about 13.6 billion years later, the universe is bathed in light from stars in a variety of galaxies, and the gas is a thousand times hotter? Answering this question has been an important goal of cosmological research over the last two decades. The conclusions of the new study suggests that reionization occurred 1.1 billion years after the big bang (or 12.7 billion years ago), quite a bit later than previously thought. 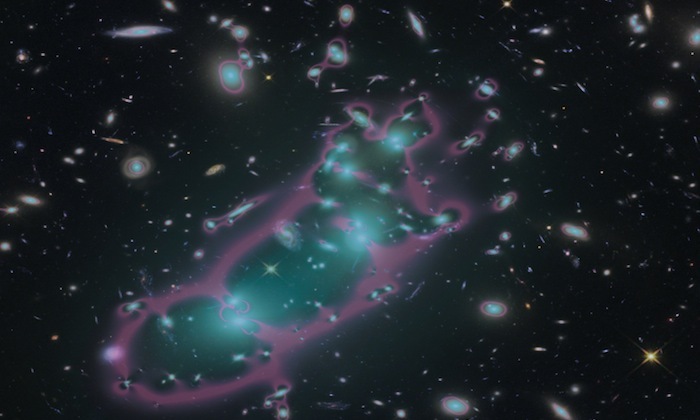 “When the universe was 1.1 billion years old there were still large pockets of the cosmos where the gas between galaxies was still cold and it is these neutral islands of cold gas that explain the puzzling observations,” said Martin Haehnelt of the Kavli Institute, University of Cambridge, who led the group that conducted this research, supported by funding from the European Research Council (ERC). “This finally allows us to pinpoint the end of reionization much more accurately than before,” said Laura Keating of the Canadian Institute of Theoretical Astrophysics. The new study suggests that the universe was reionized by light from young stars in the first galaxies to form. Searches for the most distant galaxies have now probed earlier than the first billion years in the history of the universe, early enough to start seeing the primary effects of the first stars: the reionization of neutral atoms. Astronomers want to understand how galaxies formed and evolved in this period, the timescale over which this reionization took place, the nature of the objects that provided the ionizing photons, and the scenarios in which galaxies and their interstellar medium (ISM) become enriched with atoms made in stellar furnaces. Although galaxies from this era are currently being discovered in deep optical and near-infrared surveys, most of them are low-mass galaxies, very faint, and the enrichment process is difficult to study. More luminous, massive star-forming galaxies are thought to be present and to play a major role in reionization, but because these large objects are difficult to assemble so early in cosmic time there are not many of them. Massive star-forming galaxies that contain dust emit strongly radiation at submillimeter wavelengths and these objects can be find using telescopes. They therefore offer the opportunity to study extreme cases of metal/dust enrichment of the ISM early in the era of reionization. CfA astronomers Matt Ashby and Chris Hayward were members of a large team using the South Pole Telescope to detect a set of these dusty galaxies. They determined their distances using the ALMA telescopes by looking at the redshifted wavelength of carbon monoxide molecule in their ISM. The farthest known dusty galaxy was detected in this way, and subsequent observations of it with other facilities confirmed its cosmological distance. The scientists constrained the properties of the object by modeling the observed continuum and spectral lines, and found that the object has a mass in gas of about 330 billion solar-masses; for comparison, the estimated gas mass of the Milky Way is about five billion solar-masses (most of its mass is in stars). The dusty galaxy is forming new stars at an estimated rate of several thousand per year – although with the assumption that the process is similar to what is seen in nearby galaxies. This rare and distant object offers one of the best probes so far into the activity in galaxies when the universe was very young. Figure 1. The role of small galaxies like the Milky Way’s newly discovered ultra-faint galaxies could have had in reionizing the universe. The top panel shows the number density of galaxies as a function of how bright they were in the ultra-violet (MUV), what we call the Salpeter function. The colors denote how the numbers changed with time; purple (z ~ 8) denotes when reionization occurred, and the lighter colors denote the subsequent evolution after reionization. Far more faint galaxies (less negative MUV) exist compared to brighter galaxies. Together, they produced most of the UV flux during reionization, as shown in the middle and bottom panels: the middle panel shows the density of UV photons (which is clearly highest at the faint end), and the bottom panel shows the cumulative fraction of the flux that galaxies brighter than a given MUV were generating. As much as 50-80% of the UV flux that reionized the universe may have come from galaxies fainter than MUV ~ -10! Figure taken from today’s paper. There’s hints, however, that such a simple extrapolation of the Schechter function to ultra-faint galaxies overestimates the number of bright UV-emitting dwarfs. The Schechter function predicts that we should see as many as ten times as many bright dwarfs around the Milky Way than we actually do. And it’s becoming clear that the smallest galaxies have trouble producing UV-generating stars. This would cause the Schechter function to “turn over” (see Figure 2) or predict fewer bright dwarfs (and hordes of small, dark galaxies). 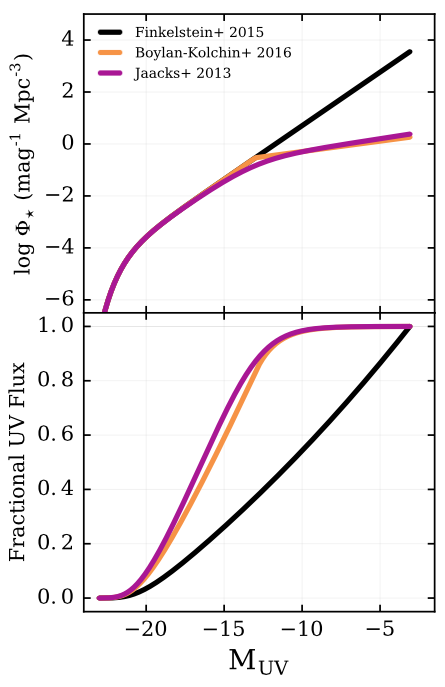 The authors show that the estimated reduction in bright dwarfs seen in simulations lowers the UV flux we should expect from small galaxies to about 10%. Tags: 21-centimeter cosmology, Astronomy ( 7,548 ), Basic Research ( 10,441 ), Cosmology ( 4,874 ), Epoch of Reionization, Symmetry Magazine ( 323 ), What ended the dark ages of the universe? When we peer through our telescopes into the cosmos, we can see stars and galaxies reaching back billions of years. This is possible only because the intergalactic medium we’re looking through is transparent. This was not always the case. Around 380,000 years after the Big Bang came recombination, when the hot mass of particles that made up the universe cooled enough for electrons to pair with protons, forming neutral hydrogen. This brought on the dark ages, during which the neutral gas in the intergalactic medium absorbed most of the high-energy photons around it, making the universe opaque to these wavelengths of light. Then, a few hundred million years later, new sources of energetic photons appeared, stripping hydrogen atoms of their electrons and returning them to their ionized state, ultimately allowing light to easily travel through the intergalactic medium. After this era of reionization was complete, the universe was fully transparent once again. 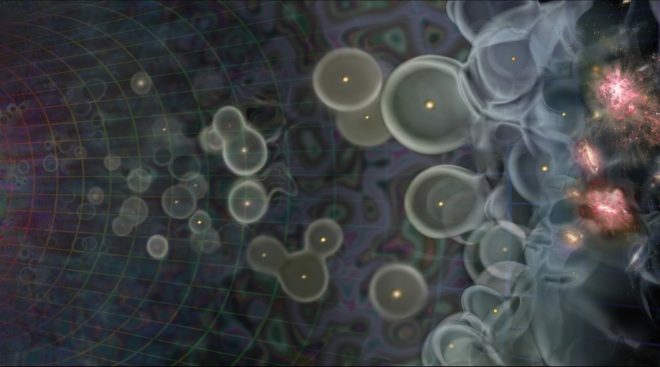 Physicists are using a variety of methods to search for the sources of reionization, and finding them will provide insight into the first galaxies, the structure of the early universe and possibly even the properties of dark matter. Current research suggests that most—if not all—of the ionizing photons came from the formation of the first stars and galaxies. “The reionization process is basically a competition between the rate at which stars produce ionizing radiation and the recombination rate in the intergalactic medium,” says Brant Robertson, a theoretical astrophysicist at the University of California, Santa Cruz. However, astronomers have yet to find these early galaxies, leaving room for other potential sources. The first stars alone may not have been enough. “There are undoubtedly other contributions, but we argue about how important those contributions are,” Robertson says. Active galactic nuclei, or AGN, could have been a source of reionization. AGN are luminous bodies, such as quasars, that are powered by black holes and release ultraviolet radiation and X-rays. However, scientists don’t yet know how abundant these objects were in the early universe. Another, more exotic possibility, is dark matter annihilation. In some models of dark matter, particles collide with each other, annihilating and producing matter and radiation. “If through this channel or something else we could find evidence for dark matter annihilation, that would be fantastically interesting, because it would immediately give you an estimate of the mass of the dark matter and how strongly it interacts with Standard Model particles,” says Tracy Slatyer, a particle physicist at MIT. Dark matter annihilation and AGN may have also indirectly aided reionization by providing extra heat to the universe. To test their theories of the course of cosmic reionization, astronomers are probing this epoch in the history of the universe using various methods including telescope observations, something called “21-centimeter cosmology” and probing the cosmic microwave background. Astronomers have yet to find evidence of the most likely source of reionization—the earliest stars—but they’re looking. By assessing the luminosity of the first galaxies, physicists could estimate how many ionizing photons they could have released. “[To date] there haven’t been observations of the actual galaxies that are reionizing the universe—even Hubble can’t deliver any of those—but the hope is that the James Webb Space Telescope can,” says John Wise, an astrophysicist at Georgia Tech. Some of the most telling information will come from 21-centimeter cosmology, so called because it studies 21-centimeter radio waves. Neutral hydrogen gives off radio waves of this frequency, ionized hydrogen does not. Experiments such as the forthcoming Hydrogen Epoch of Reionization Array will detect neutral hydrogen using radio telescopes tuned to this frequency. This could provide clinching evidence about the sources of reionization. By locating where the universe is ionized and where it is not, astronomers can create a map of how neutral hydrogen is distributed in the early universe. “If galaxies are doing it, then you would have ionized bubbles [around them]. If it is dark matter—dark matter is everywhere—so you’re ionizing everywhere, rather than having bubbles of ionizing gas,” says Steven Furlanetto, a theoretical astrophysicist at the University of California, Los Angeles. Physicists can also learn about sources of reionization by studying the cosmic microwave background, or CMB. When an atom is ionized, the electron that is released scatters and disrupts the CMB. Physicists can use this information to determine when reionization happened and put constraints on how many photons were needed to complete the process. Researchers from Russia have, for the first time, been able to measure the amount of dark matter the Universe has lost since the Big Bang some 13.7 billion years ago, and calculate that as much as 5 percent of dark matter could have deteriorated. The finding could explain one of the biggest mysteries in physics – why our Universe appears to function in a slightly different way than it did in the years just after the Big Bang, and it could also shed insight into how it might continue to evolve in future. “The discrepancy between the cosmological parameters in the modern Universe and the Universe shortly after the Big Bang can be explained by the fact that the proportion of dark matter has decreased,” said co-author Igor Tkachev, from the Institute for Nuclear Research in Moscow. The mystery surrounding dark matter was first brought up way back in the 1930s, when astrophysicists and astronomers observed that galaxies moved in weird ways, appearing to be under the effect of way more gravity than could be explained by the visible matter and energy in the Universe. This gravitational pull has to come from somewhere. So, researchers came up with a new type of ‘dark matter’ to describe the invisible mass responsible for the things they were witnessing. 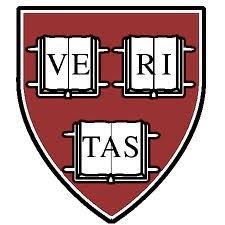 As of right now, the current hypothesis states that the Universe is made up of 4.9 percent normal matter – the stuff we can see, such as galaxies and stars – 26.8 percent dark matter, and 68.3 percent dark energy, a hypothetical type of energy that’s spread throughout the Universe, and which might be responsible for the Universe’s expansion. But even though the majority of matter predicted to be in the Universe is actually dark, very little is known about dark matter – in fact, scientists still haven’t been able to prove that it actually exists. One of the ways scientists study dark matter is by examining the cosmic microwave background (CMB), which some call the ‘echo of the Big Bang’. The CMB is the thermal radiation left over from the Big Bang, making it somewhat of an astronomical time capsule that researchers can use to understand the early, newly born Universe. The problem is that the cosmological parameters that govern how our Universe works – such as the speed of light and the way gravity works – appear to differ ever so slightly in the CMB compared to the parameters we know to exist in the modern Universe. One of the hypotheses that might explain why the early Universe was so different is the ‘decaying dark matter‘ [Nature] (DDM) hypothesis – the idea that dark matter has slowly been disappearing from the Universe. And that’s exactly what Tkachev and his colleagues set out to analyse on a mathematical level, looking for just how much dark matter might have decayed since the creation of the Universe. “Let us imagine that dark matter consists of several components, as in ordinary matter (protons, electrons, neutrons, neutrinos, photons). And one component consists of unstable particles with a rather long lifespan. To come up with a figure, the team analysed data taken from the Planck Telescope observations on the CMB, and compared it to different dark matter models like DDM. They found that the DDM model accurately depicts the observational data found in the modern Universe over other possible explanations for why our Universe looks so different today compared to straight after the Big Bang. 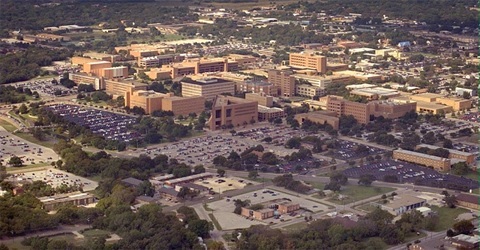 The team was able to take the study a step further by comparing the CMB data to the modern observational studies of the Universe and error-correcting for various cosmological effects – such as gravitational lensing, which can amplify regions of space thanks to the way gravity can bend light. In the end, they suggest that the Universe has lost somewhere between 2 and 5 percent of its dark matter since the Big Bang, as a result of these hypothetical dark matter particles decaying over time. “This means that in today’s Universe, there is 5 percent less dark matter than in the recombination era,” Tkachev concludes. These findings suggest that dark matter decays over time, making the Universe move in different ways than it had in the past, though the findings call for more outside research before anything is said for certain. Even so, this research is another step closer to potentially understanding the nature of dark matter, and solving one of science’s greatest mysteries – why the Universe looks the way it does, and how it will evolve in the future. The team’s work was published in Physical Review D.
The epoch when the very first stars appeared is a key period of cosmic history. 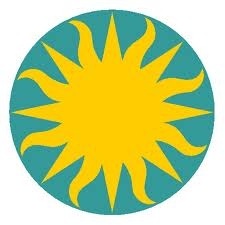 These stars began the manufacture of the chemical elements (those heavier than hydrogen and helium) and their light began the reionization of the neutral cosmic gas. These stars thus mark the dawn of the universe as we know it today and the start of the so-called Epoch of Reionization. The term “reionization” refers to the process whereby these atoms are prompted (by the ultraviolet light from new stars) to shed some of their electrons. Astronomers estimate that this period occurred a few hundred million years or so after the big bang. Neutral hydrogen atoms were the dominant element in the universe from the time they first arose, about 380,000 years after the big bang, until the Epoch of Reionization. Astronomers are now constructing facilities like the radio telescope Murchison Wide-field Array (MWA) to search for light from the hydrogen atoms at the dawn of this Epoch, a daunting task not only because the sources are so distant and faint, but also because there are so many other galaxies from much later cosmic times lying in the way and contaminating our lines-of-sight, as well as more local sources of contamination. 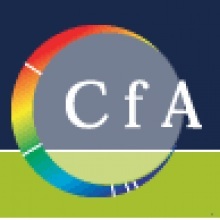 CfA astronomers Lincoln Greenhill, Justin Kasper (now at Michigan), and Avi Loeb were members of a large team of scientists that used the MWA during its early commissioning phase of operations to develop a catalog of foreground sources that could be likely sources of confusion. The MWA currently consists of 128 groupings (“tiles”) of sixteen antennae each arranged in four-by-four squares and sensitive to radiation around a meter in wavelength. The unusual telescope pattern meant that the team had to learn how to properly reduce and analyze the complex resulting data, and much of the effort in this research was devoted to these tasks. The astronomers successfully identified 7394 extragalactic sources which could be confused with earlier-epoch galaxies in their first field of the sky under study. Nearly all of these objects were associated with previously known galaxies, but twenty-five of them are previously unknown, and all of them have now been characterized. The results both demonstrate the practicality of the MWA performance and are a first step toward assembling a database for the precise subtraction of foreground radiation to uncover nascent galaxies in the early universe. A High Reliability Survey of Discrete Epoch of Reionization Foreground Sources in the MWA EoR0 Field, P. A. Carroll et al., MNRAS 461, 4151, 2016. First, the James Webb Space Telescope, scheduled to launch in 2018, will be able to look back at distant galaxies and stars that existed in small or limited numbers during the so called Dark Ages. They gradually became more prevalent and then suddenly (in astronomical terms) became common. Called the epoch of cosmic “reionization,” this period is an essential turning point in the evolution of the cosmos. Named the Hydrogen Epoch of Reionization Array (HERA), the project will focus especially on the billion-year process that changed the fundamental particle physics of the universe to allow stars, galaxies and their light burst out like spring flowers after a long winter. 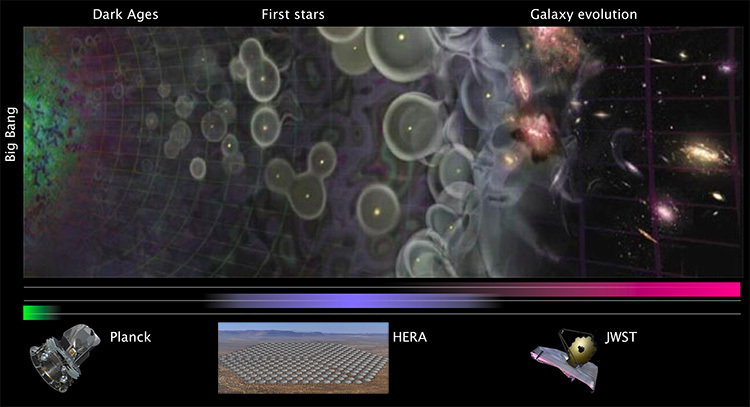 But unlike the JWST, which will be able to observe faint and very early individual galaxies and stars, HERA will be exploring the early universe as a near whole. Parsons said they see their effort as a continuation of the earlier pioneering work that identified and mapped the cosmic microwave background radiation that was produced by another cosmos-changing event some 380,000 years after the Big Bang. The HERA array currently has 19 radio telescopes, will grow to 37 soon, and to 270 in 2018. The team hopes to some day expand to 350 telescopes. Each is a of radio dish looking fixedly upwards and measuring primordial radiation. It was originally emitted at a wavelength of 21 centimeters, a key spectral tracer for the neutral hydrogen atom. The photons have been been stretched by a factor of 10 or more since it was emitted some 13 billion years ago, making the detections more easily measured. Friday 21 September 2016, SKA Global Headquarters, UK – The Hydrogen Epoch of Reionisation Array (HERA) has been awarded international funding with a $9.5 million investment to expand its capabilities, as announced on Wednesday 14th September by the US National Science Foundation. 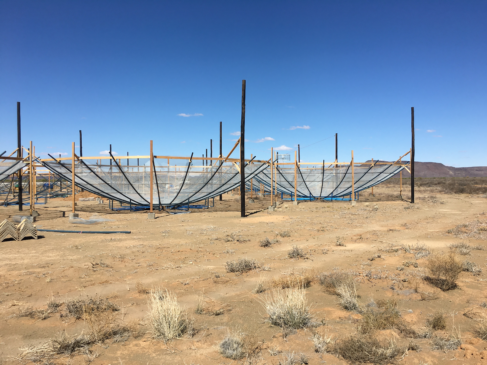 HERA, which was recently granted the status of SKA precursor telescope by SKA Organisation, currently has 19, 14-metre radio dishes at the SKA South Africa Losberg site near Carnarvon. With this fresh injection of $9.5 million, this will allow the array to expand to 220 radio dishes by 2018. HERA is an experiment focused on one science goal – detecting the Epoch of Reionization signal – and is not a general facility. As part of this effort, HERA is developing techniques, algorithms, calibration and processing pipelines and hardware optimised towards the detection of the power spectrum of the EOR, all of which will benefit SKA in designing and eventually operating the SKA-low telescope to be based in Australia. See the full SKA article here . 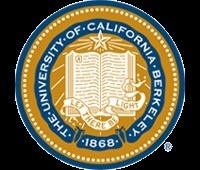 See the UC Berkeley press release here .